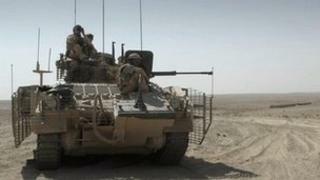 A £1bn upgrade of the British army's Warrior armoured vehicles has been announced by the government. The move was revealed by Prime Minister David Cameron and Defence Secretary Philip Hammond on a visit to defence firm Lockheed Martin UK in Bedford. It is hoped the move will extend the service life of the military vehicles through to 2040 and beyond. The MoD has awarded Lockheed Martin UK a £642m contract as part of the project, securing 600 jobs. Mr Hammond said: "As a key step towards meeting our requirements for Future Force 2020, the upgraded Warriors will give commanders and their soldiers greater flexibility and firepower. For the British army this announcement has been a long time coming. The planned upgrade to the ageing Warrior armoured vehicle - which first went into service in the late 1980s - had been put on hold while the Ministry of Defence tried to work out how to pay for it. Recent cuts in defence spending had jeopardised the programme. The work only got the go-ahead when the Treasury agreed this summer to a modest 1% increase in the MoD's defence equipment programme after 2015. That amounts to an extra £3bn - still not enough to cover the British military's long wish-list for new kit. Despite the Warrior upgrade the Army is still hoping to buy a new generation of specialist armoured vehicles - the Scout SV programme. Finding the money for that in this age of austerity will be much harder. The spirit of the times seems to be more "make do and mend". "Not only is this fantastic news for the Army, it also represents a great boost to British industry - sustaining jobs, skills and capability within the UK's armoured vehicle sector." Mr Cameron praised the role the Warrior had already played in Bosnia, Kosovo, Iraq and Afghanistan. The vehicles will be fitted with a new turret and 40mm cannon, which will allow them to fire more accurately while moving. There will also be a new armour mounting system, allowing more flexibility with different types of armour. The head of the Army, Chief of the General Staff General Sir Peter Wall, who was also on the visit, said: "This announcement of an upgrade to one of the Army's most important fighting vehicles is extremely welcome. "Warrior will continue to be at the heart of our combat capability for at least another 25 years with state-of-the-art firepower and electronics. Media captionThe head of the Army, Sir Peter Wall, says that a lot of the systems on the fleet are "in urgent need of an upgrade"
"Wherever the Army deploys, our infantry will depend on its superior protection, mobility and lethality. This will be a battle winner." Lockheed Martin UK vice-president Alan McCormick said the decision would bring "significant job opportunities" for its UK suppliers. Earlier this year, the then Defence Secretary Liam Fox told MPs the Treasury had agreed that the Ministry of Defence (MoD) could plan on the equipment and equipment support budget being increased by 1% a year in real terms between 2015-16 and 2020-21.